HACM and WWBIC's Partnership Celebrates 150 Graduates from WWBIC's 'Make Your Money' Financial Education Course — Carvd N Stone Inc.
As people walked into The Housing Authority of Milwaukee’s (HACM) Community Services Building, 650 W. Reservoir Ave., they couldn’t help but to let the aromas of Antigua Catering & Event’s food seep into their nostrils as they looked for a seat. Hot pasta, fresh salad, bread, and other dishes was free for the guest. The Wisconsin Women's Business Initiative Corporation (WWBIC) held their annual “Make Your Money Talk” ceremony celebrating their graduating class of 150 through their partnership with HACM. HACM and WWBIC have been partners for about 18 years providing financial literacy and freedom through WWBIC’s Make Your Money Talk program. According to WWBIC’s site, Make Your Money Talk offers “financial capability” workshops to provide a missing need in communities. “A lot of residents say money wasn’t talked about in their household,” said Amber Miller, WWBIC’s senior project director. But, Make Money Your Talk starts that conversation that then creates a positive ripple effect into low-income communities—which are predominantly Black. “Every penny you put into your savings is one step closer to your goal,” said Miller. Yesterday evening, families came to see the Make Your Money Talk graduates accept their certificates, solidifying their completion from the program. Jasmine Rolland spoke during the ceremony about her experience with WWBIC and their program. Rolland says she’s living proof that WWBIC and their efforts are real. Rolland is a 2016 graduate of the program. She is a mother of two, and decided to go back to school to become a RN within five years. At the time, she was attending Concordia University—an expensive private school—struggling to afford tuition. Rolland then decided to take a semester off, and in that time she discovered WWBIC. She began attending WWBIC’s weekly Saturday boot camps, which eventually lead to her also becoming WWBIC’s 2017 Match Savings Account Recipient, which does just that. Through her savings with WWBIC, Rolland was able to pay for a semester of college. She’s now a graduate and is currently working as a nurse. “Do what you can to make your payments,” to your savings to reach your goal, she said. Rolland used payroll deductions which took a fixed amount of money from every check until she reached her goal. She said this may not work for everyone, so you have to find something that works for you. “It’s about financial freedom,” Rolland said to encourage those in the room to take ahold of their financial situations, if they haven’t already. 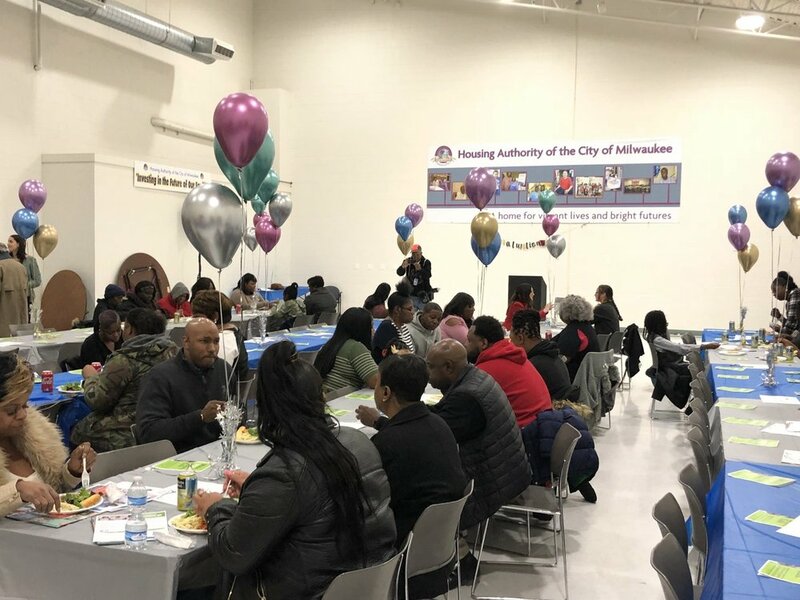 Antonio Perez, HACM’s secretary-executive director and WWBIC’s Financial Coach Shelina Harvey gave thoughtful speeches as the crowd enjoyed their food. Harvey then surprised Perez and Miller with a bouquet of flowers for their endless hardwork in growing the community. The crowd cleaned their plates as they waited patiently for the most important part, congratulating the graduates. This year’s graduating class is one of WWBIC’s biggest with their Make Your Money Talk program. The event ended with graduates receiving their certificates, picture taking, smiles and cake. Founded in 1944, HACM’s goal is to provide high-quality housing options to those who don’t usually get that chance. WWBIC was founded in 1987, and focuses on creating economic development in communities that are overlooked and sometimes misused, specifically women and people of color. Together their partnership is breaking boundaries and barriers. To find out more about HACM visit their site at hacm.org/home.